Whether you’re looking for your first car or you need to upgrade to a larger model, Ariza is here to help you with that purchase. It feels real good doesn’t it? That feeling you get when you open the door of your first or brand new vehicle. We want all our members to experience that exciting, brand new and shiny feeling when the time is right, which is why we make it easy for you to obtain a vehicle loan. Before you tell us all about the vehicle you’re excited to purchase, do some research into the available options so you know what to expect in terms of price and value for your money. Make extra repayments to pay off your loan quicker. Comprehensive motor vehicle insurance which must be assigned to the Credit Union. Invoice or letter from the company or individual selling the vehicle showing the cost. A statement of affairs showing financial commitments, monthly income and expenditure. Bill of sale required as security and in some cases, you may need to request a co-maker for your loan. I am having trouble this month making the payment. What should I do? We encourage you to contact your Loan Analyst immediately upon experiencing difficulty making your payments. We will work with you to find a solution. What are your insurance requirements for vehicle loans? We require insurance coverage to cover the amount of the loan. All auto loans must have full coverage insurance that includes comprehensive and collision for the value of the loan and we must be listed on the policy as lien holder. My loan is on automatic payments it is due on a weekend or holiday, when will it post on my account? Automatic payments are scheduled to transfer to the loan in the evening. In the event that the payment is scheduled for the weekend or a holiday, the payment will transfer to the loan the next business day, in the evening. The delayed processing will not negatively impact your account. My payment might be a few days late, will there be a fee? No late fee will be applied to your balance, however, your interest due to date might exceed your regular monthly payment. Contact your loan analyst to find out the implications of late loan payments on your account. 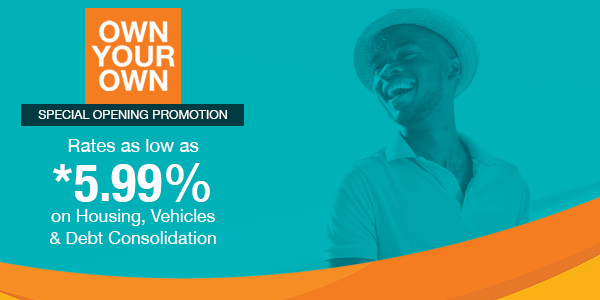 Our Own Your Own Loan Promotion is the opportunity that you have been waiting for to meet that need, want and dream.